On March 8th, in the Former Soviet Union, it was expected that all women got flowers in celebration of International Women’s Day. More importantly than doling out flowers, there were events celebrating important female scientists, engineers, and teachers. School assemblies were held in appreciation of women’s place in the world. As a kid, I didn’t know that the holiday was rooted in Socialist ideology of bringing women out of their position as second-class citizens. I had no concept of such things. Regardless of it’s pre-packaged ideology, as I look back, I can appreciate that women’s accomplishments were highlighted and talked about as part of a concerted effort. Mama and I, 1980. I think everyone had the same wallpaper. And haircuts. I remember feeling really proud of being a girl and looking up to my mother, aunt, and grandmother as they brought buckets of flowers home from their teaching jobs. They taught physics and math and no one ever questioned their gender-role in choosing those subjects. I have little nostalgia for my country of birth and carry a suitcase of painful family lore, but I am grateful for this part of my childhood. I never thought I was less valued or capable than a boy, and there was a myriad of strong, brilliant women around me to give example. 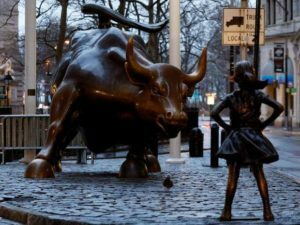 I like the new statue of a little girl standing up to the Bull on Wall Street, but it makes me sad that my daughter will still identify with a little girl who is in battle, rather than a grown woman who doesn’t have to fight for her human rights any more. Because she has won. Marita, I don’t know you but you now made me think of my childhood, which I tried not to remember for a while. My family is originally from Kharkov, and we had the same wallpaper! I work not too far away from the Bull. Thank you for giving me the new perspective with your observation. Interesting blog. – Elena.